Whether you are a Chandler, Arizona homeowner, renter or the professionals from Flip or Flop, termites can be extremely detrimental to the structure and integrity of your home. 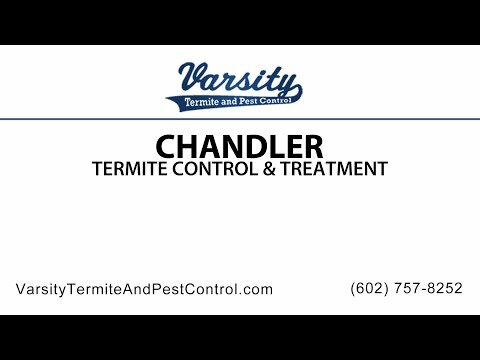 Thousands of people per year, especially here in Chandler have to resort to Chandler termite control to get a handle on their pesky problem. A termite inspection can provide great insight and information as to the kind of termite and how to best go about ridding your home of the unwanted guest. At Varsity Termite and Pest Control, our specialty is understanding how to control termites and prevent them from making their way back for round two. Six, actually. Termites come in all different shapes and sizes, well…sort of. They are all tiny, so we can at least lower down to one variable on the size factor. Dampwood, Drywood, Formosan, Subterranean, Conehead and Desert termites are among the most popular infesting and destroying the cedar planks or redwood banisters you’ve come to adore. Termites are often referred to, in the land of termite control, as the Silent Destroyer. Sounds superhero like but don’t be mistaken. These tiny critters eat anything cellulous-based, and unfortunately, every type of home can provide termites with sustenance. Often we find that subterranean termites love the Arizona desert and thrive on the heat and wood we build our homes with. Thankfully you have us to come in and regulate. The valley offers an unnaturally high concentration of water and with all of the wood structures in the Phoenix area, we provide a breeding ground for termites to thrive in. Termites can access your homes foundation numerous ways, leading to potential infestation in furniture or even books. Sorry, JK Rowling, but Sorcerer’s Stone is like a German chocolate cake to termites. If they live underground, why are they in my house? Termites are clever. As clever as you can get for an insect, anyway. They construct tunnels that become their highway for getting up close and personal with your foundation and then make their selves at home by eating it to smithereens. Most will aggressively pursue any food source they find, meaning the small openings that may not even be visible to the naked eye become a perfect place for them to start their destruction. Between plumbing and slabs, or drywall and the exterior walls provides just enough space for their tiny bodies to fit through, and when there’s one…there’s probably more than you want to think about. Something so little can’t be that hungry. You’d think…but all of the energy that they expend attacking your house’s wood allows for them to have a consistent need for energy renewal. Cellulose-based plan material, what they like to eat, is found in just about everything. Wood especially, but even concrete can provide trace amounts that they can tear through. Obvious sources are dead plants and wood within the soil of your yard but consider the other sources of termite food as you termite-proof your home. Lumber or firewood is the perfect meal for them. Try to keep these away from the foundation or crawl spaces. Stumps and debris create small, humid spaces for termites to live. In addition to the termite control that Varsity Termite and Pest Control provides, you can aid in the termite prevention by placing screens on outside vents and if you are building a new home, making sure any wood on the home doesn’t directly touch the ground. If you notice a swarm of winged insects in your home or from the soil around your house, this may indicate that termites have settled into or around your home. Sometimes cracked or bubbling paint can be a sign of termite infestation, where they’ve gotten under the paint and started to make their stay. We’re not saying go out with a hammer and hit everything (although they may make you want to) but wood that sounds hollow when tapped may also be an indicator. Remember the tubes we mentioned? These are a sure-fire sign that you’re not alone. Be aware of any mud tubes on exterior walls, wooden beams or even in crawl spaces. The easiest way to truly know if you have termites is to call Varsity Termite and Pest Control, we’re used to looking for these signs. Varsity Termite and Pest Control can handle all of your termite inspection and termite control needs, through a variety of ways. For a pretty minimal cost you can prevent termites in your home. Fortunately, for Varsity Termite and Pest Control to provide you a termite inspection, it won’t cost you a dime. Granule termiticides are safe around children and pets and help to eliminate your termite problems. Many products act like a bait in that they attract the termite and are then taken back to the colony, they’ll do the job for you if you catch the termite infestation in time. Call us today, and let us help you get your home back.